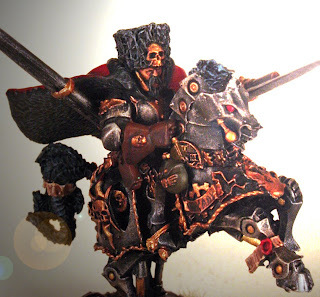 From the Warp: How do you make your army stand out? How do you make your army stand out? I suppose there are a couple different ways really. Painting, conversions, basing, theme or any combination of methods. But it all boils down to having an army you can call your own. Something that you can be proud of and is "yours." Maybe we gravitate to the method we know best... for some of us it's painting, some of us do unbelievable conversion work and some of us stick to a theme that's in line with background religiously. I don't think there is a right or wrong way. Case in point, Ultramarine Blues is going with resin bases for one of his upcoming force to make them stand out. As I was cruising the blogrolls recently, I kept coming across posts that dealt with Vostroyans. That got me thinking, I wonder what army has the hardest time standing out from all the others. Maybe a better question would be "How do I make my Vostroyans stand out from all the other Vostroyan armies out there?" And actually, you could insert just about any faction in place of "Vostroyans" in the previous sentence. Now I'm not talking about making your own chapter, regiment or hive fleet, I'm talking about Codex defined armies with known color schemes and background info. How do you make your army stand out from the others? 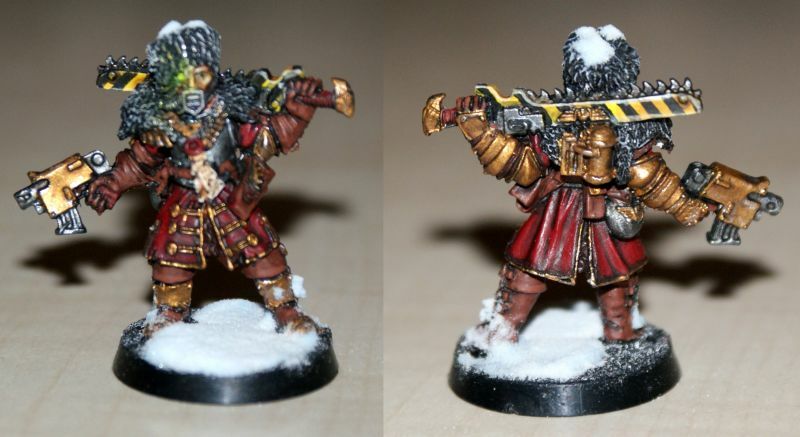 Take the three Vostroyan army examples below, all will be great looking armies when done. But what makes them stand out? I know with my Deathwing, it's the painting technique. I don't have any real conversion work in the force or any great theme (it's Deathwing, there's only so much you can field). I do have some unique looking models in the form of the pair of MK1 Land Raiders, but I'm really left with painting to make my guys stand out from all the other Deathwing forces out there. Is it enough, can it be considered a success? I don't know. They're mine, they're playable and they look different from other forces in my area (honestly just because they're fully painted), but do they stand out? That's the curse of picking a known GW force, marines are bad, but Vost's are even worse because the models are of one set regiment, so no matter what you paint them, they're still Vost's. When I started my guard, I picked a colour scheme that I hadn't seen before, over the past couple of years, I've seen the same colour scheme in loads of places. If you're not going to use alternative heads or model ranges, you're going to struggle to make yours stand out if with excellent painting as most armies are viewed from 3' away. If I knew what I knew back then, I'd have gone for alternative heads, too late now. I've noticed that it's more than enough to stand out if you've got a fully painted force done well. Most armies I see are bare metal / plastic, black primer, or some sloppy basecoats. It's a rarity for me to play against someone else with 80% or more of their models painted, the people who have managed to do that usually do a good job. For me it was coming up with a very distinct way of painting my ultramarines. I also try and do as much converting as practical with the resources I have. Other than that I guess as Simon above said, its the fact that I have never ever fielded an unpainted unit. Alternate heads, weapons, resin bases, ect...is one way to go. Personally I feel you could do a Vostroyian army uniquely(sp) by writting a bit of fluff for your regiment, battalion, company, what ever size unit you play. Then it comes down to painting them to match the fluff. If I ever do a Vost army, and I have been looking, I think I will do the color scheam for the 'Wicked Witch of the North' from the "Wizard of Oz". Grey and black, and have them be 'Almost Ran', or blamed for something they didnt do, but cant find the evidence of innosence. Semi-disgraced, and trying to get back to the 'Light of the Emperor'. Also you could mark units with wings on their shoulder's denoting that they always form on the right or left flank of battle formations. Which I believe actually took place during the Neopolian Era. Picking a unique scheme can really help. I get some nice compliments on my Dark Elves because they are bronze and red with a sand bases rather than the typical pale and purple goth elves that you see elsewhere. As Ben suggested, something as simple as a unique/different paint scheme can make a difference. My Tau are painted up in a theme mostly involving Goblin Green (and shades/tints thereof), and I regularly get comments of, "I've never seen a green Tau army before!" I think consistency is really important as well. If you can keep your painting, basing, and customizations consistent and reflected throughout the army, you can really create something that looks like a single, cohesive force. When you see an army like that on the table, it can be really striking. I point to a good example of this. No note from me, but some of the most inspiring work I have ever seen and a Blog (from a fellow FTW Blogger) I am constantly going back too to look at the pictures. Ventris has added very light details that make the shoulder pads and sometimes other areas of his models really stand out from the standard Ultramarine. These details look like etchings and designs crafted into the various armor plates. Here is one of my favorite close ups. If you have not taken the time to check out his blog go start at the beginning a work your way up to current (which unfortunately is 5 weeks ago) as his models are truly beautiful and stand out from the traditional Ultramarines greatly. Like others have said, creative paint jobs is the easiest way, simply NOT painting like they are in White Dwarf is a good start - not necessarily completely different colours/schemes, but changing the tones and techniques used. Basing is another good way to make things stand out too - it's something I'm starting to do with my miniatures. There are a few companies making good custom bases - the only problem with these is that they do add a fair bit to the cost of the miniatures as a whole. For me, I am hoping it will be conversions. 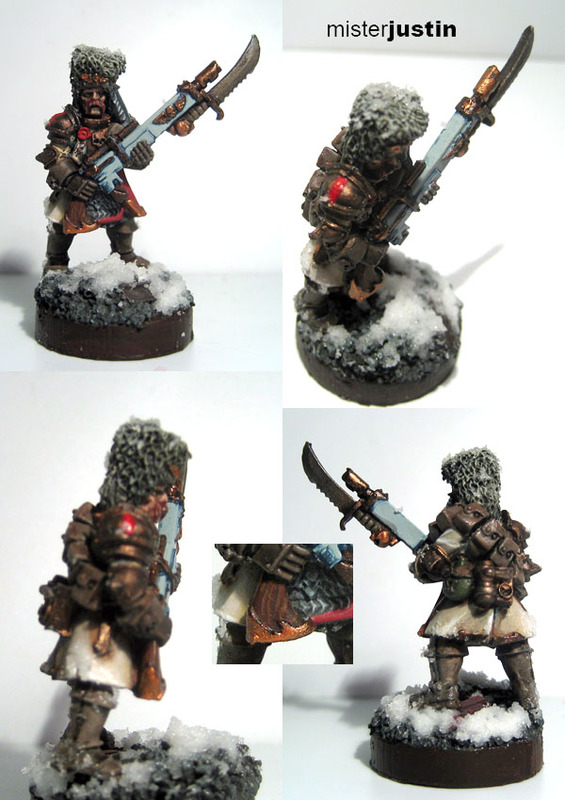 I had not seen Vostroyan Rough Riders that I liked so I made them and tried to keep them fluffy, then Vostroyan "counts as" models so I can use cool heros and units from other guard codex entries, but converted to look good in my Vostroyan army. I've always been a fan of kitbashing. Cadians plus WHFB Empire equals what constitutes my IG force. But one of the criteria I have always gone by is that the concept for my army is completely original. I've even considered converting WHFB elven dragons into an Eldar Exodite force using the Imperial Guard rules. It'll happen someday. I'm with you Ron, painting technique as well as choice of army is what leads me to hopefully have a unique army. I'm going Nurgle, so I have few more customization options than most armies. To stand-out from other Nurgle CSM armies though, I'm doing alot of conversion work. I'm avoiding the pot-bellies (going for a more decayed than diseased look) & not using any of the forgeworld Deathguard conversion kits. For the most part though, I think it's love. If you put alot of time, work & love into your models; they'll stand out. My Ultramarines a 3rd company (which I haven't seen too many of), I try to add little freehands designs to them like altering the tactical signs, adding extra ones on knees or backpacks and kill markings on heavy weapons. I think I've gone too far with my rhino - but it was my first vehicle painted so I think I've got an excuse. Heraldry on important characters is a good one and my 'final' plan will be to have a simple but interesting army/campaign badge on all models to help tie them in - this will also be on all allied models. I have never been one to paint my army in any traditional color schemes. For me it has always been about the theme of the army. What do I think that the army is about? Where did THIS force come from? Where does the fluff or the model make me think of when I look at it? Take my Tau army, I thought Japanese anime with a mix of communist thrown in. So I painted them in white and red what I tend to think of as a mix of the two things I think of when I look at that force. Then you have my Imperial guard for them I went with a water theme, the entire army is done in a coast guard theme, all the way down to water cannons on the hell hounds and super soaker flamethrowers (or water throwers as the case may be). All I am trying to say is that a theme is a pretty powerful way to get your force to stand out from others, well that and it being fully painted.